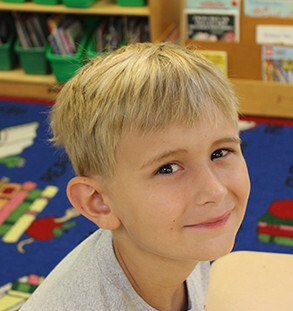 We are committed to helping children develop into well-rounded individuals. While academics are a major focus at St. John Paul II (SJPII), we believe in balancing academic pursuits with the many other facets of child development in an effort to meet our ultimate goal of guiding children to grow into secure, confident, and well-rounded people. Our teaching emphasizes the whole-human person—body, mind, and spirit. This is how God has fashioned each of us, and so we strive for excellence as we provide an environment for the growth in these areas for each student. We teach students the importance of self-discipline, respect for themselves and others, integrity, and service within a curriculum that teaches Sacred Scripture, the life and teachings of Jesus Christ, and the history and practices of the Catholic faith. Students and staff enjoy the blessing of celebrating Mass each Friday morning and the Sacrament of Reconciliation on the first Thursday of every month. Learning our faith and living our faith are inseparable at Saint John Paul II Catholic School. In a time when many Americans battle obesity or other related health conditions, we take physical fitness seriously at SJPII. All students from preschool through the eighth grade participate in the PE program. In addition to 30 minutes of recess each day, preschool through fifth grade students enjoy PE class every week. Our middle school students have PE twice a week in addition to daily recess time. We also build health lessons into the students' learning experiences. The PE program gives the students the opportunity to develop skills and knowledge and encourages them to pursue a lifetime of fitness. We try to keep fitness fun by providing a variety of movement activities through vigorous play. The PE program also incorporates teamwork, good sportsmanship, integrity, acceptance, and encouragement of others into our activities. Music education is an integral part of aesthetic experiences and, by its very nature, is an interdisciplinary study that enables students to develop sensitivities to life and culture. Students will develop attitudes, knowledge, and performance skills that will enable them to perceive music as an art. Preparation, understanding, and participation of students in Catholic schools in religious celebrations enrich both the mind and heart in the offering of prayer to God through song, instruments, and dance. Our music curriculum centers on seven strands: vocal expression, instrumental, improvisation and composition, artistic perception, evaluating music, connections, and historical and cultural context. Allowing God to continue to create through every child is the core of the visual arts program. Creativity is God’s gift to each one of us, and we, as His creations, are meant to use this gift in all possible ways. Using the gift is a way of returning the gift to God. The visual arts program seeks to open students’ eyes, spark their imagination, direct their hands, and channel their intellect to explore media and techniques, learn the elements and principles of design, and enhance their problem solving and communication skills. Most importantly, the visual arts program seeks to open students’ souls to the pure creative energy in all of life and instill confidence in the use of God-given talents. When we open ourselves to exploring our creativity, and open ourselves to appreciating the creativity of others, we open ourselves to God. As the second most spoken language in the world, we at SJPII feel that every child should experience exposure to the Spanish language. Students in preschool through fifth grade receive Spanish instruction every week, while our middle school grades 6–8 receive instruction twice a week. Upon graduation from SJPII, most students should be able to test out of the first section of high school Spanish with ease and continue on a path of advanced Spanish instruction at any public or private high school in the state. SJPII recognizes that technology is a vital element of meaningful 21st century learning. We equip every classroom with a SmartBoard for interactive teaching, and students across the grades have access to laptops for research, word processing, and other special activities. Students also have the option to participate in virtual high school experiences, including an online geometry class. To keep abreast of the latest technology tools, our teachers take part in Google for Education training. In addition, they participate in an online professional development community using Edmodo. Our teachers work continuously to integrate technology applications and tools into their daily activities. We provide students in grades 5–8 with 1:1 laptop access. Research consistently supports that students are stronger writers, more effective presenters, and demonstrate greater technical proficiency when they have consistent 1:1 access. We also schedule bring-your-own-device days to facilitate project tasks. We have a lot going on here at SJPII. Visit our Clubs and Activities page to see the variety of programs we have to offer. We have something for everyone!